It was a beautiful autumn day here in New England and Julia spent some time outside riding her bike and playing on her scooter and shooting baskets. Tonight, Julia and I were interviewed on a web talk program, The Don and Carla Show. They contacted me over the weekend via email, presumably having found the Diary with a web search. The topic of tonight's show was "Living With a Handicap." I explained that Julia is not handicapped in the usual sense of the word, but they wanted to talk to us anyway. There was a misunderstanding about the start time of the show; I thought it started at 8:00 Eastern, but it was actually scheduled to start at 9:00 Eastern. At about 8:10, when we realized this, I sent Julia to bed, telling her I'd wake her up when they called. Then they had technical difficulties, and the show didn't actually start until 9:15PM. They called and as soon as I said "Hello," we were on the air! After cordial introductions, they asked easy questions about what JDMS is, how it's treated, and what the prognosis is. Julia was asked a couple of general questions, and we then spent the most time taking about coping, due to the topic of the show. We talked about finding ways to cope that fit in with your personality style, and seeking support and help wherever possible. At the end, I plugged the Myositis Association of America, the MAA's Bulletin Board, and their Conference next week. I also mentioned e-mailing lists. I tape recorded the webcast, and Julia's mom was listening the whole time. She said there were several cutouts during the broadcast. I haven't listened to the tape yet. If I have time, I'll see if I can transfer selections from the tape to MP3 files. Another tiring day for Julia. The usual routine - Gym, Dance, and plenty of homework. This week, among other things, she has to write an analysis of how the major presidential candidates stood on certain issues based on their statements during the first debate, held near us in Boston. I took Julia into Boston today to get her lab tests done. It was very much an in-and-out trip. This afternoon, we went to a local Fair. They block off some streets and just let everyone go where they want. They also had some rides and craft booths. It was a fun way to spend a beautiful New England autumn afternoon. We got all the test results back from Dr. A.W. today - and they continue to be great! She also said we can drop Julia's Prednisone dose from 6 to 5 mg/day starting tomorrow. We're all very pleased. Juila's school nurse called and said Julia has a stomach ache. I talked to her on the phone and she clearly was not feeling 100%. It was already after noon, so I arranged to pick her up from school instead of her having to ride the bus home. Her mood was definitely subdued, but by bedtime, she said her stomach ache was gone and her mood seemed normal. It's Friday the 13th and a Full Moon, and we're taking a plane trip today! We're off the the Myositis Association's annual Conference. I went to this conference alone last year, but all three of us are going this year. BTW, the trip to McLean, VA was uneventful and actually rather pleasant, despite the omens of the date and phase of the moon. The Hotel was one I've stayed in before (traveling on business), but it's been completely remodeled since then. It's really very nice. After we settled into our room, we headed to a nearby Mall to get some dinner, and ended up at the Rainforest Cafe. It's expensive, but it's a lot of fun and the service was very good. We also bought some snacks and drinks for the weekend at a CVS in the mall instead of paying the wet bar or gift shop prices at the hotel. After dinner, we went to the Conference reception. We were full from dinner, so we didn't have any of the wonderful-looking hors d'ouvres they provided. They had a theatre set up to play a movie for the kids, but they picked The Little Mermaid, which was a little simplistic for most of the kids, who were mostly 7 and up. It was great to see some familiar faces from last year, although several MAA staffers (those I know of: Joanna Eros, KIT director; Mike Curry; Sallie Wolf) have since left the organization and were sorely missed. We met several other families that are also dealing with JDMS. Some were just diagnosed in recent months, others have been dealing with it for years. It was a pleasant way to get introduced. Overall, I think the reception was a big success. Julia was looking forward to a field trip that was scheduled for Saturday afternoon. They were going to bring the kids to Newseum, a museum for news, which promised to be a lot of fun for them. Unfortunately, we learned at the reception that they had to cancel the trip due to lack of interest - only one other kid besides Julia signed up for it. Julia was rather disappointed. Breakfast today was a combination of food ("continental") and a presentation about Prednisone from Dr. Chester V. Oddis, from the University of Pittsburgh School of Medicine. He spoke in what the average person would consider technical jargon, but I got the impression that it was almost too simplistic for most of the audience. The MAA Conference brings a very sophisticaed listener to all the presentations. He spoke in general about Prednisone. It can be delivered via inhalation, intravenous, intramuscular, orally, or via "pulse" (high IV dose over several hours, which is what Julia got last year). He also talked about dosing. He said that a given dose can be administered in one of several ways - one-third of a daily dose administered three times a day, one-half dose administered twice a day, a full dose given once a day, or a double dose given every other day. These dosing strategies go from most effective with the most side effects, to the least effective with the least side effects, respectively. He spoke more about pulse steroid therapy. Normally, this is a dose of 1000mg of Solu-Medrol given up to three times a day. It's used to treat serious effects of Myositis (such as acute muscle inflammation and/or weakness, or lung problems). It's also used to spare oral Prednisone use, and in Juvenile Myositis, it's shown to be effective to treat a persistent rash and calcinosis. He was asked about using Prednisone against IBM (Inclusion Body Myositis). He stated that there can be an inflammatory effect with IBM, especially versions that have some crossover into other auto-immune diseases. In these cases, it may be partially effective. However, he said that use of Prednisone with IBM is controversial. The disease's onset is usually very slow, and the effect of Prednisone is often minimal at best. Some do have a positive effect from it, but most do not. He suggested trying a moderate dose of Prednisone for a short time, then taper and discontinue it if it's not effective. What happens to the side effects as Prednisone is withdrawn? He spoke about Cushingoid syndrome; a full recovery is expected. The bones can recover fully, but osteoporosis can happen as people get older. This let to a discussion of how to combat osteoporosis. He suggested remaining physically active (weight-bearing exercise), increasing dietery calcium by 1000-1500mg/day (in 2 or more doses), increase in vitamin D (400 IU), taking a medicine such as Fosamax (10mg/day, or possibly 70mg/week, a new regimen that is currently being tested), Actonel (5mg/day), or Miacalcin (a nasal spray). He also suggested maintaining supplemental calcium after Prednisone is withdrawn completely, unless its causing a problem or if the person has a high natural level of calcium. What are other side effects of Prednisone? He spoke about supression of the immune system, and how Prednisone is given to cancer patients and others. This does lead to succeptability to infections, especially for long-term use. It can also take longer to heal from injuries. He said that it's said "Prednisone takers can walk to the morgue," meaning that it keeps them active and strong even as it kills them. I asked him if there were any special side effects in children taking Prednisone. He did say that most kids have growth suppression and younger ones need to be careful about immunizations. Can an infection cause a flare? He said yes, it's possible, because the infection excites the immune system. Does Prednisone affect vision? Yes, it can cause glaucoma, cataracts, and blurred vision. There is no preventative action that can be taken. He stressed the importance of seeing an eye doctor regularly to treat anything that comes up. He was asked why blood pressure drops as Prednisone is tapered. He said that the reason is that elevated blood pressure is a side effect of Prednisone, and once used to a high dose, the body adjusts. As the dose is reduced, blood pressure can fall, sometimes to below-normal levels. Dr. Oddis was asked want to do about diet. He said "lock the fridge." Everyone laughed. Someone asked about taking Prednisone during pregnancy. He said that Prednisone can be taken by a woman during pregnancy and that it will not cross the placental barrier to the baby. Therefore, there is no toxicity to the fetus. Other steroids can cross the placenta and therefore can cause problems - some early studies have shown an increase in birth defect, like cleft palate, in these cases. He went on to mention a new drug called Deflazocort. It's in some limited use in Europe, and is not yet approved for use in the U.S. It's a different steroid, with dramatically fewer side effects, but may be less effective than Prednisone. I did a 'net search and came up almost empty-handed, just a few references from people asking about this drug. Following breakfast, the conference room was enlarged and rearranged to accommodate the Medical Panel of Experts. The Panel consisted of Dr Oddis, Dr. Fred Miller, from the FDA, and Dr. Paul Plotz at the NIH (National Institutes of Health). Dr. Miller was the Moderator of the discussion. We had heard that there was supposed to be a breakout session for JDMS children with a counselor on Saturday morning. Julia & I looked around for it, but we couldn't find it - I think we might have been too early. So, instead, we went back to the main session with Ralph. Julia read and colored throught the first group os speakers, but was understandably bored - any 9-year-old would have been, although Ralph & I both found the speakers very interesting. Although she was reluctant, I finally convinced Julia to go with me to look for the childrens' group again, and this time we found it. There were actually 2 groups; one with a counselor for the children, and one with a counselor for the parents. Julia still wasn't too hot about the idea, but she agreed to join the 2 boys who were talking to the children's counselor, and I went with the parent's group. Although each parent had different issues to deal with, both related to the severity of their child's illness and their own methods of dealing with the stress, it was somehow comforting to be with a group of people who were all dealing with JDMS, in one way or another. It helped me to feel less alone - these were people who understood exactly what it was like to deal with the drugs, and the side effects, and all the doctors, and the frustration, and the fear of the unknown. Some of their children were affected more severly that Julia, and some were affected less severely, which helped put Julia's case into perspective. The counselro took us through a relaxation technique using soothing music and visualization, which was nice, although not new to me. When Julia came back from the children's session, she said it wasn't too bad, which I judged to be pretty high praise, considering her initial reluctance to participate. She told her group about Quinacrine, which they had never heard of; the counselro made sure to mention this to the other parents, in case it had the potential to help their children also. The counselor also taught the children a relaxation technique focusing on the repetition of the word "One." Julia actually used it one night to help her fall asleep. Aroung 11:00, the sessions ended, and Julia & I joined Ralph, who was just getting out of the main session. We were glad that we got the chance to go to the smaller sessions and would hope this same opportunity is available at future conferences. Dr. Miller opened with some general remarks. He expressed his disappointment with the lack of progress with Myositis research. He said he was hoping to "turn the corner" in the coming decade as far as discovering causes and effective treatments. He then introduced Dr. Plotz. Dr. Plotz began with a medical student's list of indicators for inflammation. Tumor (swelling), Rubor (redness), Calor (warmth), and Dolor (pain). In Myositis, all but the latter are almost always missing, and most Myositis patients have no pain (although some do). This is a big part of what makes diagnosis so difficult and often delayed. - Remarkably symmetric involvement; Sometimes, this is different muscle to muscle, but it's always the same region to region, fasicle to fasicle, within fasicles, and even within cells. The boundaries for diagnosis are not often unclear. He then talked about the mechanism involved with Myositis. Primarily, it is vascular (involving the blood vessels). In Dermatomyositis, it is also cytotoxic (but "strange," in his words) and in Polymyositis/Inclusion Body Myositis, lymphocytes tend to be involved. He spoke about how cells are injured and/or die. He said that cell death in Myositis is not well understood, but it has been shown not to be the conventional apoptosis. Partial death sometimes occurs, and regeneration can sometimes even occur. He mentioned one unusual case of IBM. It was in a young man in hos 20's who was shown not to be suffering from hIBM (hereditary IBM). He had no apparent inflammation, normal CK, but his biopsy was conclusive. He also said that they took 11 biopsy samples into the lab and let several experts look at them without being told anything about the patients' histories. only 2 of the 11 biopsies were conclusive and matched the clinical observations. This indicates that much more needs to be known about the disease process to be able to make clearer diagnoses. He then referred to a single-page handout. Dr. Plotz is trying to develop a group of investigators from around the world. They are trying to agree on common terminology, common measurement and description tools, comparing results based on location and population, and initiate trials large enough to give significant results. Dr. Plotz also spoke about genetic research going on. He commented that there is probably no such thing as a single gene for anything. Many so-called genes actually sequence multiple proteins, and that genes interact with each other and behave differently at different stages of their lives. He hopes that this genetic analysis will lead to new descriptions of diseases, and to new routes to treatment. He did speak of a need for animal testing - he appealed to this audience as one that fully understands that need. There is currently no way to give any animal Myositis. [Note: some breeds of dogs do get a form of Dermatomyositis. However, the disease process is different, and Dr. Plotz is talking about a way to control which animals have DM. Thanks, Cheri!] However, some genetically engineered mice can display some of the features of Myositis. For example, the have manipulated the mouse gene for JO1 and those mice display Anti-JO1 antibodies, which is commonly seen in Myositis patients. He showed a slide that showed two mice, one normal, and the other much smaller and thinner. He said these were two mice from the same litter, the normal one without the JO1 modification, and the smaller, weaker one with it. Finally, he encouraged everyone in the audience to make their voices heard. He said we need to let the people in control of funding know about these diseases and ask them to fund research. He commented that some diseases that occur much less frequently even than Myositis are much better funded because the patients are more vocal. Someone in the audience commented that "we need a celebrity!" and he agreed that would certainly help. Dr Oddis' formal presentation was entitled Treatment Strategies: Inflammatory Myopathy. He began with some definitions of terms. He defined a Retrospective Study (done after the fact), a Prospective Study (pre-study planning done), Placebo Controlled (inactive substitute for drug being tested used for some patients), and Double-Blind (neither doctor nor patient know whether a plecebo is delivered). He went on to list some of the difficulties in assessing treatments. These include misdiagnosis, bias introduced by studying a too-small number of patients, retrospective studying, inadequate treatment duration, poor long-term followup, inability to distinguish between active (inflamed) tissue and inactive ("scar") tissue, and the diversity of myositis itself. He went on to list the types of Myositis: PM, DM, JM (usually DM, or JDMS); Myositis in overlap with another immune disease (such as Lupus, Scleroderma, or Rheumatoid Arthritis), IBM, and Myositis assiciated with a malignancy. He listed the most common Myositis treatment options: Prednisone, Immunosuppressives (Methotrexate, Cyclosporine, et al), IVIg, anti-TNF agents (Etanercept, Infliximab), monoclonal antibodies (anti-C5, anti-CD20), Oxandrolone (for IBM), and others (such as stem cell transplant and anti-cytokines). He stressed that many more drugs are coming, and in fact there may be too many of them to study them all properly. - Fludarabine (NIH study, anti-cancer agent) - 16 patient 6-month trial; 4 improved, 7 unchanged, 5 withdrawls, 1 unexpected death. He termed this a "modest" result. - TNF Inhibitors (Etanercept, Infliximab) - Block inflammation source. Used in RA; rapid acting (weeks), minimal short-term side effects. Long-term side effects unknown. - Etanercept (Enbrel) - Study with 4 female patients (aged 39,35,29, and 9) unresponsive to other treatments, all were able to discontinue Steroids; some had minor side effects (infections and injection-site soreness). Expensive, but less expensive than IVIg. Not yet published, very small study group. - Infliximab (Remicade) - Study with 1 PM, 1 DM; IV given at start, 2 weeks, 6 weeks, then every 2 weeks. DM rash "vanished" after 1 treatment. No side effects. CK & disease activity improved but did not normalize. - IVIG (IntraVenous Immunoglobulin) - Patients deteriorated or relapsed on conventional therapy. Study with 5-day course, the monthly 3-day course. 4 of 5 DM and 1 of 2 PM patients improved. All 4 w/Overlap improved functionally. Conclusion that IVIg is effective in non-responsive DM/PM. - IVIg in IBM - Progressive double-blind placebo-controlled cross-over study: 6 months of drug or placebo, then switch. No progression in 90% of patients, mild functional improvement. Longer-term studies needed. - Oxandrolone in IBM - Synthetic testosterone w/anabolic (muscle-building) action. Placebo-controlled, double-blind study w/15 IBM patients. Initial impression is this is not greatly beneficial; mild strength improvement. No mention of side effects. - Anti-C5 in DM - monoclonal antiboody that binds with C5, a "complement" (plasma proteins that are deposited & lead to inflammation), preventing inflammatory cascade. 1 patient so far, 2 more starting week of 10/16. No results yet. - Rituximab (anti-CD20, works against B-cells) in DM - Unpublished study w/26YO and 11YO; both failed multiple other treatments and both responded (improved strength and rash) after just one treatment. Very promising. He then talked about combination therapies - that is, using a "cocktail" of multiple drugs. This is being done in other areas (i.e., AIDS) to great success. Sometimes, two drugs will work together, when neither would work alone. These kind of combinations can reduce toxicity, and provide greater flexibinity and number of treatment options. Finally, he talked very briefly about "novel therapies". One that is mentioned is a Stem Cell transplant. He knows of no attempted use against Myositis, but has heard of successes against Lupus and Scleroderma. He also mentioned Anti-cytokines, saying that they would work similarly to the Anti-TNF agents that are currently being studied. Dr. Oddis finished with a summary of what he presented. This was a very intense and technically challenging presentation. After these presentations, the Panel took questions and answers. The questions were submitted by members. They were read alternating between IBM and PM/DM questions by volunteers. Presumably, they weeded out frivolous. too-specific, or redundant questions. I will present all the PM/DM questions first, then all the IBM questions. It makes more sense to me that way, instead of alternating the questions. Q: I've been on IVIg for 2 years and on Enbrel for 5 weeks; why do I still have a DM rash? A: (Oddis) There is still too little experience with combination therapies to say with any assurance. Q: Is Cytoxan given for PM? A: (Oddis) Cytoxan is a chemotherapy drug. It's very powerful and may cause cancer. A: (Miller) It has been studied, but there isn't much information. The study generally didn't find Cytoxan useful, except when there is also lung disease or Vasculitis in combination with Myositis. Recommend doing other treatments first. Q: Do vaccinations (specifically, the flu shot) cause Myositis? A: (Miller) An ongoing study expects to publish results next year. Q: Can muscle strength be improved through diet? A: No. Diet deficiencies need to be addressed, but aside from that, the disease process is not affected by diet. Q: Any studies of long-term IVIg use? A: (Miller) No. All side effects seen with IVIg are short-term and acute (infections, clogged vessels). No study is ongoing. A: (Oddis) IVIg has been given for other diseases for a long time, no major long-term effects have been seen. Q: If PM is not responding to treatment, does it mean IBM? A: (Plotz) Not necessarily. IBM diagnosis is based on biopsy and other factors. Q: What about pregnancy during a PM flare? A: (Oddis) If a flare occurs during pregnancy, the outcome tends to be worse for both mother and child. If there is no active disease, the outcome tends to be good. Q: Does a husband's DM affect his wife's pregnancy? Q: Is there any significance to specific antibody identification? A: (Plotz) These are a good research tool. Certain antibodies are associated with clinical patterns, i.e., Anti-JO1 is often associated with lung disease, arthritis, etc. It helps the doctors know what to look for. The actual tests are hard to come by but can be useful to confirm a diagnosis. Q: How well do CK levels correlate to disease activity? Some people have high CK and are okay, other have normal CK and are miserable. A: (Oddis) CK is one component that needs to be examined on a case-by-case basis. The worse case he'd ever seen had a peak CK of 243; has seen other cases of normal CK but very sick. Other cases, CK of 400-600, but patients stable and functional. A progression of CK level changes can predict flares. Q: What is your opinion of MedicAlert bracelets? A: (Miller) Helpful to identify medications being taken in case of accident. Q: How do I get access to therapies being studied? A: (Miller) None of these are approved by the FDA, insurance won't cover them. Q: How do we get the government to increase the level of funding for Myositis? A: (Miller) Write your representatives and senators, educate as many people as possible, get a celebrity advocate. Q: Why do I have increased menstrual pain with Prednisone - especially pain in legs - and worse with a higher dose? A: (Miller) Disease activity can sometimes follow the menstral cycle. Prednisone can alter the cycle. Q: Tell me more about Dr. Plotz' NIH Multinational group. A: (Miller) it's a one-time effort to organize research around the world. Q: Any relation between Alzheimer's Disease and IBM? A: (Plotz) Considers it "poetic" to think there may be any connection. It's an "elegant" idea, because the same kind of fibrous deopsits (amyloid plaques) are seen with both diseases, but he doesn't think they are related. Alzheimer's has already been shown to be caused by a difference gene. There is no research being done in this area. A: (Oddis) This trial did a biopsy, then treat with IVIg and then another biopsy. The second biopsy did look better (less inflammation), but there was no functional improvement in patients. Maybe needs to be studied longer-term. A: (Miller) How do we know when someone is better? It's always subjective. Q: Any correlation betwen IBM and Gout? A: (Oddis) No. People who tend to get Gout are in the same general demographic as IBM patients. IBMers don't seem to get gout at a higher rate than the general population. Exception: Cyclosporine can cause Gout as a side effect. Q: IBMer on IVIg for 4 years. Can they get off it? A: (Oddis) Can't answer. Has there been any improvement? A: (Miller) Interferon-beta being studied, may have completed recently. Not sure. A: (Oddis) No preliminary data is available yet. Q: Can IBM be triggered by exposure to radiation? What about other triggers? A: (Miller) Anecdotal evidence only. There is no real evidence of a radiation trigger. Q: How many IBMers have other diseases? A: (Miller) 10-15% have other immune diseases. Also, frequently other family members (ancestors) have auto-immune diseases. Q: Are any of these therapies helpful for IBM? Hyperbaric Oxygen, Human Growth Hormone, CoQ-10, Acupuncture, Creatine. A: (Plotz) No to all of them. hGH: help build muscles; may be interesting to study (says he has a note to himself to study this someday); CoQ-10: he thinks not. If Mitochondria are affected, it may help. Creatine: no reason to think it may help, and it may actually be a cause. Q: What medications should IBM patients avoid? A: (Plotz) Penicillimine may cause Myositis; STAC (cholesterol-reducing) drugs may also cause muscle problems. He has a list of 52 drugs that were each taken by a patient before their case of Myositis was disagnosed. Q: Hereditary IBM (hIBM) passed by a father to his son and daughter. What about their kids? A: (Miller) Genetics do play a role. There are 4 genetic patterns for IBM, but the actual genes are not yet known. There is no tool available to predict who will or will not get it, unless everyone gets it. Q: Does the age of onset affect the progression of IBM? A: (Miller) Not known and not being studied. Q: Does Myositis lead to cancer? A: (Plotz) There is no relation between IBM and cancer. However, there is a relationship between DM and cancer. Sometimes, DM is triggered by a malignancy that has not been detected yet. This is not a permanently increased risk - if no cancer is found within 2 years of the DM diagnosis, then the cancer risk returns to that of someone in the general population. A: (Oddis) Before treatment begins, capillaries can leak , and muscles in the lower extremeties may be weak. Prednisone can cause some swelling in IBM patients, and the wasting of muscles stops the return flow of fluids. Q: Does IBM affect internal organs? A: (Oddis) Rarely. Older IBM patients have problems with this more often. Q: Do muscle cells regenerate with exercise? A: (Oddis) This is an ongoing controversy. If the disease is truly "active", then rest is advisable. Once the disease is under control, exercise is a good idea. Recommends ongoing stretching exercise to prevent atrophy, contractures. A: (Miller) Agrees. Latest recommendation is to do more exercise earlier than previously thought. It's a good idea to see a Physical Therapist or Occupational Therapist for advice. Q: What effect do cholesterol-lowering drugs have on IBM? A: (Miller) There drugs can sometimes cause/trigger the disease, but in IBM patients, there is no need to avoid them. Q: Experiencing unrelieved, excessive plain with IBM? A: (Oddis) IBM itself does not cause pain (the audience murmurs at this statement). Pain may be caused by atrophy that stresses joints, Prednisone-induced osteoporosis, etc. There are no effective therapies for IBM pain. After the Q&A, we all sat down to a rather formal lunch. The opening course can best be described as "tomato Jello" - it tasted like V8, and no one at our table could identify it. Julia looked askance at this and a waiter offered her a fruit cup, which she graciously (and eagerly) accepted. The rest of the meal was more conventional (and delicious). We were seated at a table of about 10, and all 4 major forms of Myositis were represented at our table. After lunch, we had a JDMS session with Dr. Lisa Rider, a researcher at the National Institutes of Health. Dr. Rider is one of the leading researchers in JDMS, and is involved in many studies. There were about a dozen or so people in the room (actually, part of one of the restaurants in the hotel), and Julia was the only child there. She was bored, but kept herself busy and quiet very well. She began with an overview of JDMS. JMDS is the most common member of the family of "Juvenile Ideopathic Imflammatory Myopathies" (or JIIMs). It's believed to occur in kids who are genetically succeptible and are exposed to a trigger. She showed a slide that several photographs on it. One was a microscope image of peri-vascular inflammation. She pointed out ischemia in areas that lead to smaller muscle fibers. The slide also had an image of an MRI, apparently a thigh muscle cross-section, showing bright areas that indicate edema and inflammation; this was just like the MRI that Julia had done at her diagnosis. The next image showed calcinosis, and the last showed some rather gruesome shots of skin ulcerations, which are another possible disease effect. She said that the incidence of JM is about 3 per million children per year in the U.S., about five times less than the incidence of adult Myositis. The peak age of diagnosis is 4-14 years, with an average of 7; in Juvenile Polymyositis, the average age is 9. The disease strikes all races and all continents of the world approximately equally. The incidence of JDMS in the US is 68% caucasian, 15% black, and 16% other, about the same proportions as the general population. The female:male ratio is about 2-3:1. She stated that blacks are at higher risk for poor outcome. She also said that clusters of disease incidence in time and space suggest that the environment may be a factor in some cases. Next, she compared and contrasted Juvenile and adult Myositis. Both forms have many similarities. They have the same clinical and lab results, the same risk factors, the same triggers. The same pathology (B-Cells, T-Cells, CD4+ and Macrophages are involved), and the same antibodies are detected (Anti-Synthetase, Anti-SRP, Anti-MI2). There are some differences. In the clinic, Juvenile is 85% DM, 8% PM and 6% Overlap with other immune diseases. In Adults, 37% DM, 27% PM, 19% IBM and 17% overlap. Some Antibodies are also different. In Juvenile, 80% exhibit Anti-MSA/MAA; adult, 51%. Juvenile 8% Anti-JO-1, adult 21%. Juvenile, 5% Anti-U1NRP, adult 11%. She also said that triggers may be different - some adult cases are triggered by silicone breast implants, which children do not receive. Heart and lung involvement are more common in adults, but calcinosis is more common in Juveniles (30% vs. 5%). Kids sometimes suffer lipodystrophy (loss of body fat), but adults do not. Skin ulcerations are also more common in kids than adults. Finally, there is more disability and mortality in adults. In her next slide, she talked about Disease activity vs. damage. She showed some "reversible" manifestations, like the skin rash, that appear when the disease is active. She showed more photos of irreversible damage, such as scars caused by the rash, joint contractures, and muscle atrophy. She said that it's often difficult to accurately assess disease activity. They consider objective measures (lab tests), systemic illness, strength assessment (especially in younger kids), confounding factors, and prior disease damage. She showed a chart that indicates that disease damage, because it is permanent, tends to be accumulate over time, even though there are times of disease inactivity. She spoke of an agreement by a group of doctors of how to do more objective analysis of disease activity and damage. They decided to measure disease activity based on muscle strength, dysphagia (difficulty swallowing), dysphonia (difficulty speaking), GI bleeding, ulceration, heart disease, lung disease, CK , Aldolase, ILD, and biopsy results. They agreed to assess disease damage based on Calcinosis, atrophy, functional limitations, and joint flexion contractures. They studied a series of cases on paper and found that they were very much in agreement on how they assessed them. She referred to a Likert Scale. They also found an excellent correlation between the doctors' evaluations and the parents' evaluations. They also found good correlation between that and the patient's own ratings. They said it was a good idea for doctors to listen to patents and their parents to get a more complete picture of what is going on. Dr. Rider then spoke about an objective set of tests being developed called Manual Muscle Testing (MMT). MMT is used to determine patterns of weakness, grades of muscle weakness, and to test individual muscles. In the case of JM, they found proximal muscle weakness 89% of the time, distal weakness 70% of the time, and axial weakness 79% of the time. She said that JM patients exhibit a remarkable symmetry, with the exception of the left bicep, which tends to be weaker. She also said these tests showed good validity compared to biopsy and MRI results. Her next slide was about functional assessment. They have a CHAQ - Childhood Health Assessment Questionaire. It's give to families to assess whether the patient can do certain tasks. They also are developing something called a CMAS - Childhood Myositis Assessment Scale. The CMAS is used by doctors. They perform a series of tests to measure strength and endurance. They also use timed functional tests and repetitive exercises. She promised to show us a video tape of these tests later on. Next, Dr. Rider showed us a chart with the enzymes measured to assess disease activity. She made the statement that CK is the least well correlated to disease activity. They also measure Aldolase, SGOT (AST), SGPT (ALT), Creatine, and CK-MB. She went on to say that measuring and tracking any two of these enzymes tracks disease activity as well as any 4 of them, implying that it may not be necessary to track them all. She then said that MRI can be "very useful". It can show the difference between disease activity and damage. T1-MRI tends to show disease damage, and STIR-MRI (short-T1 inversion recovery MRI) shows more disease activity. Skin disease activity can also be seen on MRI, and subcutaneous tissue inflammation is also visible (subcutaneous inflammation often occurs in areas that may eventually have calcinosis). Fascia-area tissue (surrounding muscle tissue) can also display inflammation in an MRI image. Dr. Rider then gave us a summary of her presentation. - Enbrel study - New, in Chicago only, only for active disease not responding to other treatments. - Vaccination Myositis Study - vaccine as a trigger. 60 enrollees (20 are kids). The jury is still out on this study. Q: Does JDM or any medication affect the heart? A: No. Tachycardia may be a problem, not known. Some kids get out of shape; they eat more, can't exercise as well and get tired easily. An aerobic exercise program is a good idea. There is a study in this area. Q: Does JDM cause muscle pain? A: No. Most muscle pain is cause by muscle tightness, overexertion. Range-of-Motion and stretching exercises should be done regularly. Q: Can Prednisone cause myopathy? A: Steroid Myopathy is possible, but extremely rare. This can be detected if there is no other disease activity (confirmed by MRI or biopsy), lab results are at or near normal, but there is still weakness. She cited one case where this happened (we are friends with this family, as it happens), and reducing Prednisone provided dramatic relief. Q: What can be done for pain management in severe calcinosis? A: She said the calcium deposits should be surgically removed if they are so large that they are causing discomfort. Q: What are the implications of positive Anti-Nuclear antibody (ANA)? Q: What are the results of Dr. Reed's demographics JDMS study? A: Abstract available through the ACR. Q: Is Minocycline (or other low-dose antibiotic therapy) effective against JDMS? A: Unknown, it needs to be studied. Q: Does having JDMS cause more auto-immune disease later in life?? A: Not known, needs to be studied. There is always the possibility of a DM flare as an adult. Q: What can be done for Prednisone dependence (can't taper from low-dose of Prednisone without flaring)? A: Try using Prednisone-sparing agent (such as Methotrexate). At this point, I had to leave the session (for reasons that will become evident). Julia and her mom stayed and watched the video tape about the muscle strength test standard that is being developed. The reason I left the JDMS session a few minutes early is because I am one of the presenters at the Conference. My presentation was entitled "Finding Medical Information on the Internet." It's a Powerpoint presentation that I converted to HTML. My presentation also required me to be connected to the Internet, so the hotel ran a phone wire from who-knows-where into the conference room for my laptop. It worked, but I think the length of the extension wire prevented me from connecting at any speed above 28.8K. The talk was very well attended - there had to be over 100 people in the room by the time it was over. My talk was designed for those who already have a connection to the Internet and know how to use basic tools, like a web browser. There was no way I could teach the basics of Internet access and usage in a reasonable amount of time. I think unfortunately that some people were expecting that level of detail, but most people seemed to think the talk was helpful, and the feedback was generally positive. The MAA gave me a gift, a canister of "Simply Virginia" peanuts, which are delicious! After all the sessions were done for the day, several of JDMS familes met (rather accidentally) and decided to go out to dinner together. This serendipitous meal turned out to be one of the highlights of the weekend. We took out our caravan of rental cars and drove to the nearby Silver Diner restaurant. The decor is, as you might guess, very 50's diner style, lots of chrome and vinyl, and the menu was dominated by burgers and milk shakes. There were 7 adults, all at one end of a long table, and 5 kids at the other end. The kids largely occupied themselves while us grown-ups talked and shared. We had a wide range of experience with JDMS represented - one mom just had her son diagnosed a few months ago, and another family has been dealing with it for over 6 years. We each had our different expereinces that we shared - how to explain JDMS to family, friends, and co-workers; how siblings deal with it; what doctors do and don't tell you; how to cope; and on and on. It was very theraputic for all of us, I think. It was a truly unique experience for us - to share with that many families who are all dealing with JDMS all at once. After 2+ hours of talking and eating, we split the bill and headed back to the hotel. I can't speak for the other families there, but this was a fantastic experience for us. This alone was worth the time and expense of coming to the Conference. The Conference started out this morning with a *full* breakfast, much to the delight of Julia who was bemoaning the fact that yesterday's breakfast was just continental. There was supposed to be a meeting of the MAA's K-I-T (Keep-In-Touch) leaders. I was going to attend, but the meeting never materialized. We used the time to finish packing our room and check out. The final session of the weekend was a group counseling session. They brought in professional counselors for each of the 4 major Myositis groups, plus one for caregivers. We attended the JDMS session. The counseling session was hosted by Kamau Johnson, PhD, a licensed clinical health phychologist affiliated with the American School of Professional Psychology in Arlington, VA. The session was attended by everyone who went out to dinner last night, sans kids, except for Julia and one boy about her age. The session was geared for the parents, and the kids were very bored, unfortunately. We were also joined by one of the members of the MAA Board of Directors. He has IBM. It wasn't entirely clear to me why he attended the JDMS session. Dr. Johnson was very friendly and seemed very well prepared, despite having admitted that he only first heard of JDMS a few days earlier. The conversation moved along very well, but we covered a lot of the same ground we covered during our meal out the night before. I judge that the familiarity we had with each other let us carry the session farther than it would have if we were meeting for the first time. We all agreed it was worth going to. The SOS book looks the most promising; I may get it. If I do, I will read and review it. After the counseling session, Dr. Johnson was chatting with me and I mentioned this web site. I could see his amazement as he realized something. "You mean that's the Julia?" I laughed. It turns out he'd been pointed to the Diary by an MAA staffer to familiarize him with JDMS. He complimented me on the site and I thanked him for his kind words. He said he felt like he knew a lot about us from reading the Diary (I get that a lot from people who email me about it). It felt good to have this site continue to have a positive impact. After the session, we decided to forego the Conference closing comments and headed out to the airport. We had a very nice lunch at one of our favorite restaurants, Legal Sea Foods, which has a location right in the airport terminal. We were not rushed, and it was a pleasant way to wait for a plane. During lunch, Julia was playing with an ice cube by seeing how long she could stand holding it on the back of her hand. After a couple of minutes, we dumped some salt on it to see what would happen. Oops. The ice cube stuck to the back of her hand, and she had to go to the restroom to run warm water over it. Double oops! It left a red circle on the back of her hand. Hope it isn't a problem. It was only on there for a few minutes. The rest of our trip home was uneventful, which is the way travel should be, but often isn't. That "frozen" spot on the back of Julia's hand is starting to get ugly. It's now a darkening circle about the size of a nickel. It resembles a bruise. The spot on Julia's hand is now very ugly. It's a dark, almost maroon, circle. The skin on it is starting to wrinkle at the edges and it seems to be separating from the skin underneath, much like a blister. I have a feeling it's going to separate completely and fall off. I hope it doesn't leave much of a scar. Tonight, we went to Spooky World, a Halloween "theme park". It's been in the area for the past 10 years, but this is the first time we've gone there. We went because my company offered VIP tickets (shorter lines, free food, freebies) for a discount. It was a beautiful and unseasonably warm day and evening, which made it perfect for the outing. We had a great time! The place has several "haunted" buildings, such as a haunted disco (in 3-D!! ), a haunted mine shaft, and a horror museum and gift shop. There was also a haunted hay ride. The first thing we did was the mine shart, and Julia absolutely freaked out. We even had to leave the ride in the middle of it. After she calmed down, she went in to everything else, and some of it was a lot scarier than the mine shaft, and she was fine with it. I guess the intensity of the ride was a little too much for her, even though we prepared her for it as best we could. Inside the 3-D Disco, we noticed something very weird. Julia's fingernails were glowing a bright green under the black lights. Her knuckes were also giving off a slight green glow. In contrast, Julia's mom and my hands were giving off no glow at all, or perhaps a very faint bluish glow. It was very weird and I plan to ask the doctor about it next time. 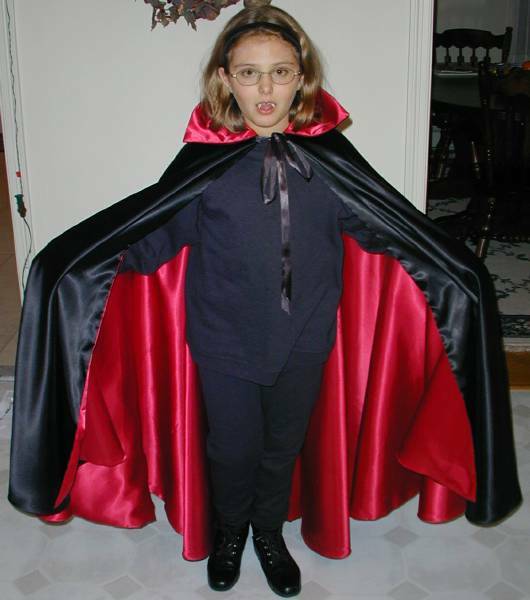 They were doing scream auditions for Buffy the Vampire Slayer, and Julia tried out! She did a good job, but her scream was a lot lower in pitch than I expected. (no, I didn't record it, but the Channel 56 TV people did) Some of the other people trying out, teenagers mostly, were screaming so loud I thought various internal organs were going to come flying out of the booth. There were plenty of Spooky World workers (cast?) going around in costume. We kept running into the headless horseman, but there was also an evil looking giant, some undead souls, a lounge lizard, a witch, a clown, and Jack the Pumpkin King from the movie The Nightmare Before Christmas (which is an excellent movie, BTW). The costumes and makeup were very well done. There are apparently a lot of frustrated and wannabe actors working there. We got there early, so we left early, by about 9:00. When we were leaving, the line to buy tickets to get into the place was at least a quarter mile long! Amazing. We had good timing and had a lot of fun. Julia has started a new activity. She's joined the children's choir at our church. That means rehersals every Sunday morning. She really wants to do this, and I think it'll be a nice compliment to the keyboard lessons she's already getting each week. We did notice that Julia's rash seems to be a bit worse the past couple of days. Her cheeks are redder and her eyelids are a bit on the pinkish-purplish side. The blister-thing on the back of Julia's hand peeled off its top layer today, revealing some better looking pink skin underneath. It looks very much like a healing blister. It actually looks a lot better this way than the dark-red circle that was there before. I don't think its even going to leave much of a scar, if any. I still shake my head at the weirdness of this thing. Julia's school threw it's annual Halloween party tonight. It was held in the newly and beautifully refinished parish center at a local church (nor ours). Julia is dressed as a vampire (or vampress). Julia's mom knocked herself out, as usual, to get the hand-made costume done on time. It's a black cape with a red lining. Julia also got some white face makeup (which we put on and immediately took off when she didn't like it), red lipstick, fake fangs, and a trickle of fake blood for the corner of her mouth. The fangs actually worked very well - they use a "dental putty" to custom-form themselves to her teeth, so they were a perfect fit and stayed in place very well. They also looked great. Parents who didn't dress up in a costume for the party had to pay a $1 "fine" to get in. As usual, there were a ton of very creative and well-made costumes. There were a few other vampires, but I think Julia's costume looked the best of them by a lot. There was snacks, a DJ who introduced us to the "Who Let The Dogs Out" phenomenon, and some great costumes on some parents, too. They gave prizes for the best kids' and adults' constumes after a parade. We all had a fun time. Another day, another Halloween party. One of Julia's schoolmates had a party tonight, so she went. Not really sure what happened during the party - this was essentially free babysitting for us. We dropped Julia off at the beginning, after dance practice, and picked her up at the end. In between, Julia's mom & I went out for a nice dinner and ran a couple of errands (typical). There appeared to be about 30 kids there. Happy Halloween, everyone! It was a miserably cold, rainy day here in New England. By the evening, it was drizzling heavily (or raining lightly, depending on your point of view). Julia wanted to go out trick-or-treating anyway. Surprise, surprise. A friend of ours came over and the two of them went and visited all the houses on our street. Julia did great - they climbed all the hills and visited all the houses. The went our late; it was almost 7:00 before they left, so they were one fo the last. Lots of houses realized this and dumped a lof of candy on them because the turnout was light because of the weather. Of course, she got a huge pile of candy.